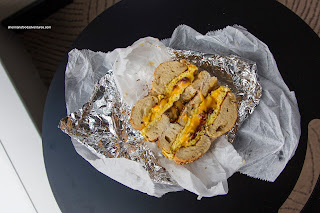 It is not lost upon me that there are many good bagel spots in NYC, in particular Manhattan, however, due to our tight schedule, it was not possible to get to them all. Since we had a good amount of food lined up anyways, we couldn't dedicate time to travel for bagels. 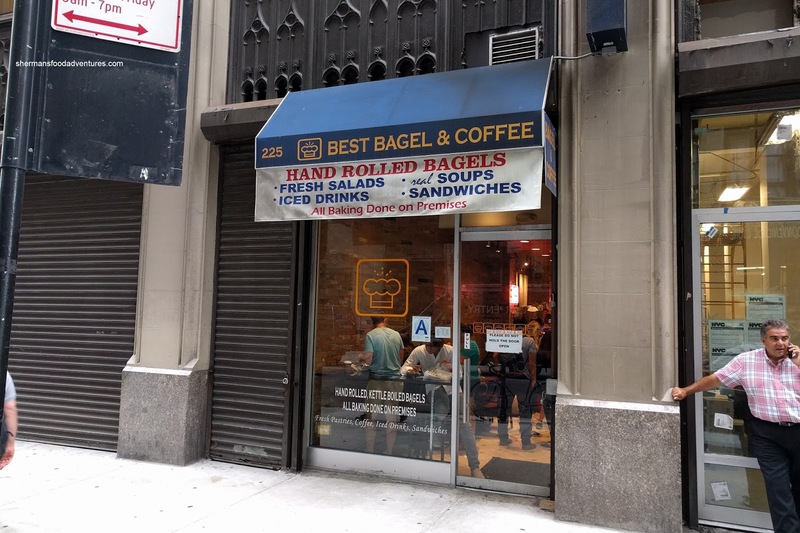 Fortunately, one of the better places was located across the street from us being Best Bagels and Coffee. Costanza pointed out that in the movie Elf, the "world's best coffee" wasn't really a good indication. I did consider running into the place and congratulating them on the "best bagels & coffee" though. Not. So for breaky, I decided to brave the fast-moving lineup and got myself a Bacon, Egg & Cheese Everything Bagel as well as the Poppy Seed Bagel with Salmon Lox. As much as putting in the order was seemed quick, it did take a bit of time for my bagels due to the preparation of the egg and bacon. 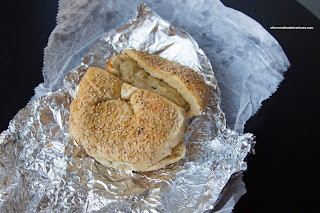 I found the everything bagel to dense, chewy and slightly sweet. There was a considerable amount of fried scrambled egg, crispy bacon and American cheese. This was quite substantial as a breakfast sammie, so I split it with my son. The poppy seed bagel had the same qualities except a bit drier on the outside and slightly crispier from being toasted. 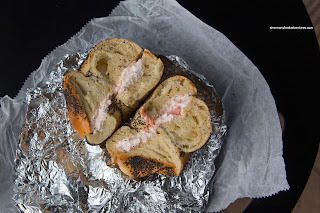 They weren't conservative with the thick cream cheese which contained a significant chunks of buttery salmon. On another morning, I got a Sesame Bagel with just plain butter and I enjoyed this for the simplicity of it all. The crunchy exterior gave way to a chewy interior that was again, rather sweet. There was a good amount of melted butter to moisten the denseness. Not the "best" bagel I've ever had, but considering the circumstances, these were good and did the job. Now for the coffee, again, let's just say they are not the best.